I love clotted cream. If you haven’t had it, it’s kind of like a mix between whipped cream and whipped butter, but with a deeper flavor. It’s thick, it’s creamy, and it’s absolutely dreamy on scones warm from the oven. Clotted cream and scones have always been my favorite part of afternoon tea. I’m obsessed with it. So much so that sometimes, for a treat, Mike and I will go on a little afternoon date to a little British themed teahouse here in town for scones and clotted cream. I never dreamed that I could make clotted cream, also known as Devonshire cream, at home. They do sell tiny jars of Devonshire cream at fancy stores (like Whole Foods), but save your money friends because those jars of cream are nothing like the real thing. Dare I say they’re disgusting? 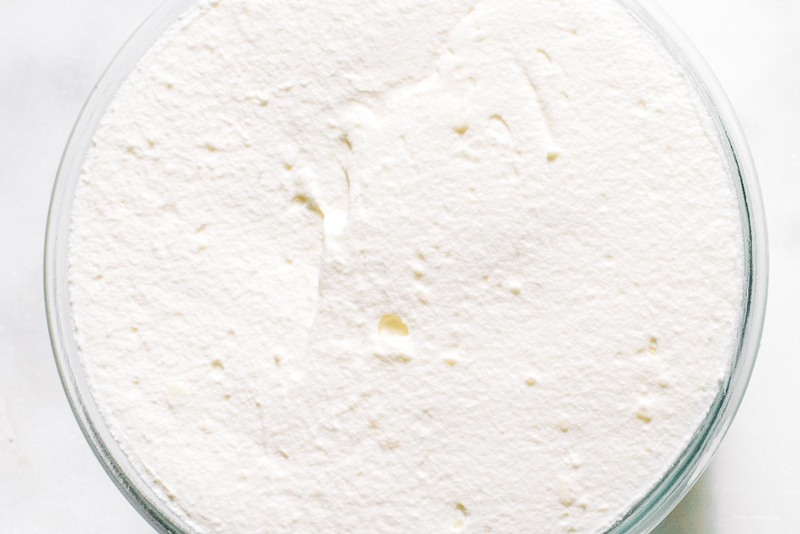 Instead, buy a quart of good quality, organic whipping cream, and make your own, at home! Mike: You should make clotted cream. Me: Dude, I don’t know how to make clotted cream! Mike: Baby, I love you, but if we have to go to Secret Garden one more time to feed your clotted cream addiction, I might just go crazy. Me: Yeah, I know it’s not really your scene (the scene there is more octogenarian than our normal hangouts)…but they have clotted cream to go! We can just buy it and have it at home? Mike: If they can make clotted cream, you can make clotted cream. It sounded impossibly easy and too good to be true. Was I really one ingredient and 2 days away from my own unlimited source of clotted cream?! Mike and I immediately went out to find some non-ultra pasteurized cream. I popped it into the oven and the next day, there it was! The top of the cream had solidified into something resembling clotted cream. It just needed a little while in the fridge before it was ready. It was so incredibly satisfying to scoop off that top layer of chilled cream. I whipped it up to give it some body and had some immediately on toast, with jam and a generous sprinkle of flaky sea salt. It was SO GOOD. Maybe even better that the clotted cream from the teahouse? We did a side by side taste test (yup, Mike and I went to the teahouse one last time to get some takeout clotted cream) and the difference was indiscernible. Mike felt that the store made version was saltier, which makes sense, considering that I didn’t salt ours at all. It was also a touch more whipped. Salt and whip away to your preference, you’re this close to homemade clotted cream! toast and clotted cream for everyone! PS – That last shot is clotted cream with a bit of powdered strawberries and gold flecks! Heat your oven to 170°F. Pour the cream into a deep casserole dish that has a cover that can go into the oven. You’re aiming for a deep dish so that the cream is about 2 to 2.5 inches deep when poured in. I used a casserole dish with a glass cover, kind of like an old school pyrex type thing. Cover the dish and place in the 170°F oven for 10 to 12 hours, or overnight, which is what I did. The next day (or 10 to 12 hours later), remove the casserole from the oven and let cool to room temperature before placing in the fridge for a minimum of 8 hours, or overnight. Skim off the top, slightly golden, thickened layer. This is your clotted cream! There will be another layer under the slightly yellow layer that is creamy and thick like sour cream – this is clotted as well, but with a bit more moisture in it. Skim that off as well. Use as is, both the thickened creams are considered clotted. Some people mix the two and some people just use the top layer. Or, you could use a stand or hand mixer/a spoon and mix up the the two kinds of cream until thick, but this is not traditional at all. Serve chilled and enjoy! 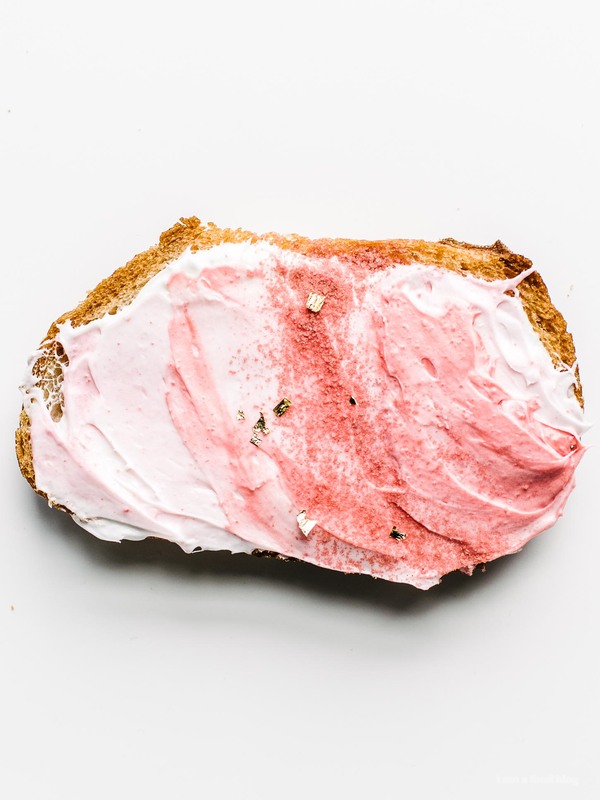 I love it on scones, toast (SO GOOD), cake, basically anything or everything! 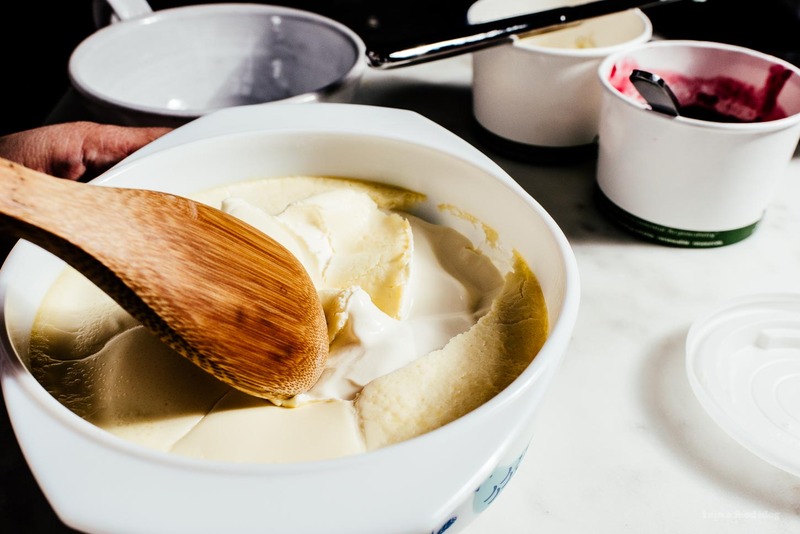 The clotted cream should keep in the fridge for up to 5 days, covered. Notes: Be sure that your cream isn’t ultra pasteurized – double check while you’re buying the cream. If it is ultra pasteurized, it’ll say on the carton/bottle. The original recipe just stirred the cream together, which I think would work as well, but I wanted a more smooth, whipped consistency. Whipping the top two layers together is NOT traditional. Brilliant! The little bottles at the grocery store are so expensive! 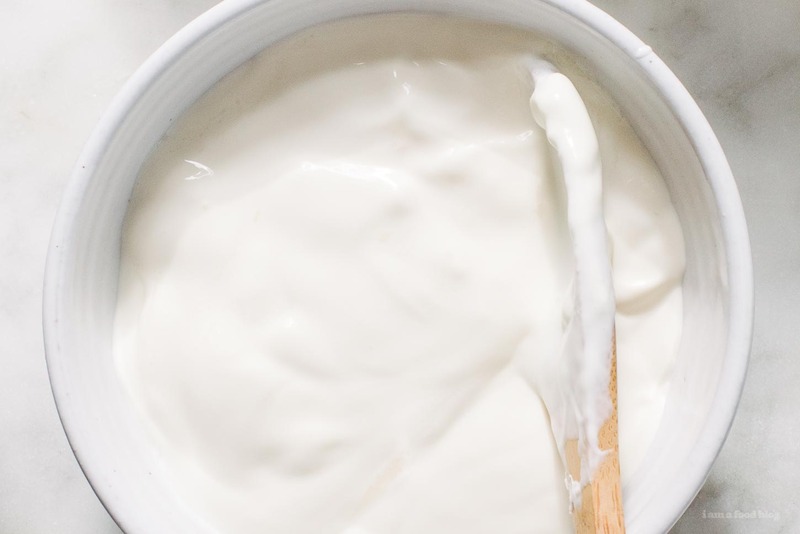 Which brand of whipping cream did you use? I definitely plan to try this out. Do you know what would happen if you didn’t use ultra pasteurized heavy cream? That’s all I can find in the stores near me! i haven’t tried it but i heard that it won’t clot – you’ll come back the next day and the cream will look exactly the same. but i can’t 100% confirm this either. one reader did try and it worked for them, but they did it in a slow cooker. Thank you! I will either have to try with the UP version or search high and low for non UP version in NY! Wait, I’m a bit confused. Am I supposed to whip the top yellow looking layer and the layer right under that together to make the clotted cream or do I whip them separately and have one yellow clotted cream and one white clotted cream? I’m not sure how to read this. i whipped both layers together! Hi guys, your clotted cream looks great! Here in Newfoundland I grew up with cream and wild blueberry jam on fresh out of the oven homemade white bread. It’s still one of the best things ever! We always spread cream on toast with jam too. Believe me, I know your addiction. In our family it’s practically genetic. I coincidentally found your post on Instagram because of your 150 buns recipe…I’m doing that campaign too and was grilling in 2 degree weather here in St. John’s yesterday! Spring has abandoned us! I expect it’s much warmer in your neck of the woods. cheers to being bun recipe mates! can’t believe it’s 2 degrees in st. johns…brr!!!! Do you think that it is the heat or the evaporation that is more important in this? I’m curious about trying this using a sous vide. The heat should still cause the clotting but I am trying to avoid a dried out layer of cream on the top. it’s the evaporation and the heat that you want. the top dried layer is what you want! Love clotted cream!!!!! Baaaah, this recipe is so dangerous! Its so simple! I can’t wait to try it out on scones and toast and all of the things!! this looks DELICIOUS! i love clotted cream and im pretty sure the first time i had it was when we were in london for our london trip! it was as delicious as i had expected. I love afternoon tea and scones with clotted cream are also my favorite part! Question.. once you skim off the two top layers of cream, is there something under it? If so, what do you do with it? or what can you do with it? yes to the blended freeze dried strawberries! SECRET EFFING GARDEN Steph WHY HAVE WE NOT GONE THERE TOGETHER YET. Haha that place is my secret love. This might just be a stupid question, but thought of asking before I attempt this. Do you leave the oven running at 170 for those 12 hours or you just preheat to warm it up? Thanks! We just retuned from our 1st trip to London. I LOVE scones (husband doesn’t!) It was my 1st taste of colored cream which always came with the cream and a small jar of strawberry jam. I am in love with this new flavor! Your recipe is the one I opened and I will be making it tomorrow. We are going to a cabin in the mountains for a week with our family and I can hardly wait to make it!! i whipped it up but it’s definitely personal preference! What’s the problem with ulra pasteurized? Please please DO NOT whip the clotted cream! It ruins the consistency, after all that effort and time spent making it. I’m from Dorset, and grew up on clotted cream. It’s supposed to be served with the crust on the top, and with a rich thickness. 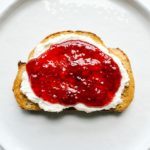 In fact, it is so thick that you shouldn’t be able to spread it on top of jam – the clotted cream is spooned onto the scone and the jam put on top. 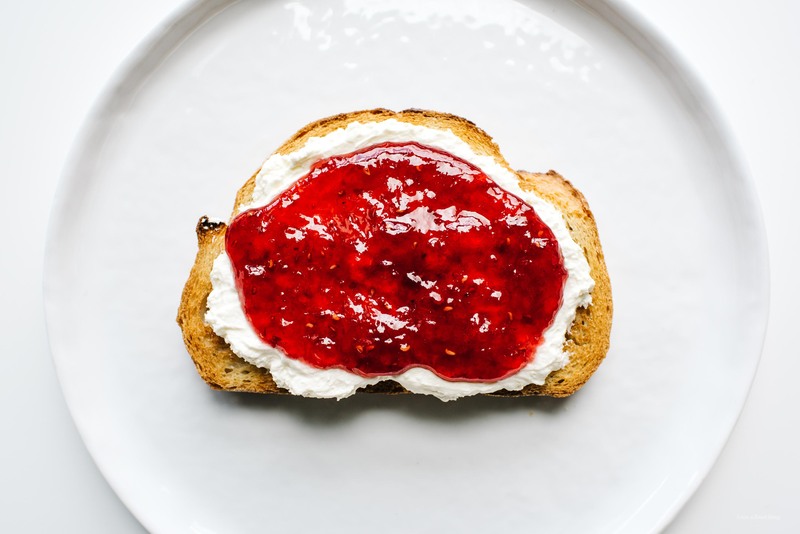 If you do it the other way around, then the jam gets smooshed – its almost like trying to spread butter over jam. i haven’t tried, but the internet says that it won’t clot, it’ll just stay liquid. Hi, I have cream in the oven now. The recipe I used didn’t say to cover the cream in the oven. Sooooo…anyway I’m just wingin it! Also I didn’t know to use un-pasteurized cream. Can I salvage this project? It’s been in a 190 degree oven for 6 hours. Beautiful golden crust, and it smells heavenly! Now what? I don’t want to break the crust, so I didn’t shake the dish. I think it is still runny under that top layer. Any ideas would be appreciated. By the way, I’m JennE & I love to have tea if it’s an excuse to eat scones & clotted cream! Hi, I’ve been researching clotted cream recipes as I’m originally from UK, live now in Australia and want to make some cream for my hubby who was born in Devon and misses clotted cream. The traditional recipes used full cream quality milk with a high fat content not a cream or a whipping cream some of which have thickeners added. The finished texture should be more like a thick set honey and not aerated and whipped. I’m a little confused. If it’s all about the evaporation, why do you cover it? I just made this using heavy cream from my local dairy and the results were amazing. I just recently tried clotted cream while in Scotland and fell in love with it. Thanks for this recipe! Making some now. 12 hrs to go! Can’t wait!!! Hi! Thanks for the recipe. I followed your instructions to the letter, but when I peeled off my layers of clotted cream, the top part was really tacky. I tried to whip them together and it turned out like clumpy butter. 😞 Where did I go wrong? Thanks. the top layer is pretty tacky/solid. traditionally most people don’t even whip it, they just use the most top layer (and the layer right underneath) and spread it on to scones, etc. otherwise, it could be that your cream was ultra pasteurized? how did it taste? it’s also possible that it became butter-like because it was whipped too long. Same results for me, clumpy butter and I barely whipped it at all before it clumped up… used organic not ultra-pasteurized… Wonder why? 1. is your over temperature accurate? 2. what was the texture of the cream before you whipped it? 3. after the 12 hours were there three separate layers of cream? 4. did you refrigerate overnight? also, traditionally, clotted cream is not actually whipped, how did it taste/look before whipping? The very best cream is Cornish Clotted Cream. As a child I saw it being made on a farmhouse kitchen scale where it was ‘scalded’ in a pan over boiling water; and would dip my finger to lift a bit when she wasn’t looking. Using really good milk from South Devon cows; and only taking the creamy portion of the ‘separated’ milk (the thinner portion, the skimmed milk of today, was fed to the pigs).